Preheat oil in Presto® electric deep fryer. If using an adjustable thermostat deep fryer, set at 375°. Combine flour, sugar, baking powder, cardamom, and salt in mixing bowl. Combine eggs and 1 cup milk; pour into flour mixture and stir until smooth. If batter is too heavy, add additional milk. Batter should pour in a heavy stream. Pour about 1/3 cup of batter into funnel. (Hold finger over end as funnel is filled.) Hold funnel over preheated oil in deep fryer; release finger and let batter pour into fryer in a circular pattern. Fry 1 1/2 minutes; turn and fry another 1 1/2 minutes. 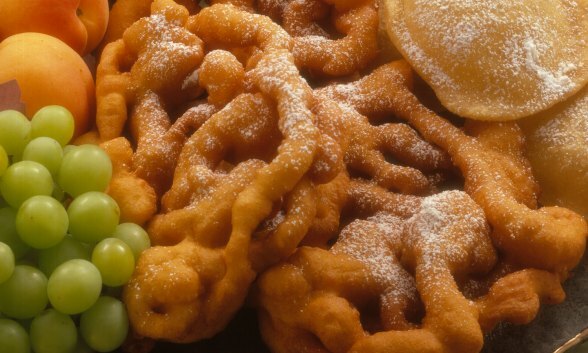 Fry one funnel cake at a time. Continue until all batter is used. Serve warm with powdered sugar. Click here for more information on our line of quality Presto® Deep Fryers. Batter may also be poured slowly in a circular pattern into hot oil from a 2-cup glass measuring cup. *Reference your deep fryer instruction folder for amount of oil needed.